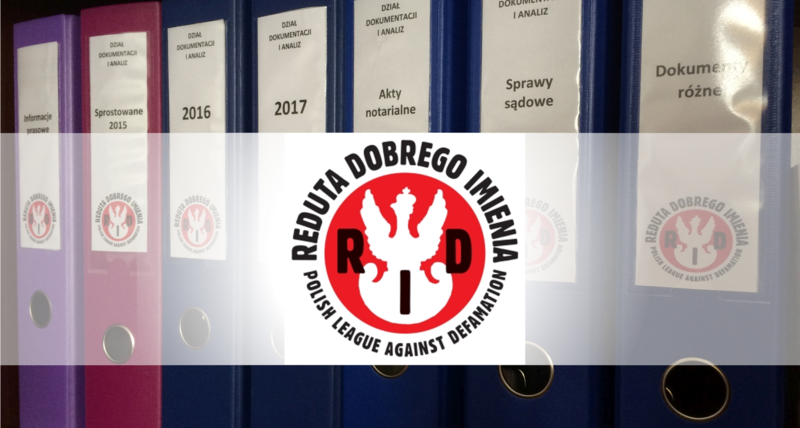 The Good Name Redoubt – the Polish League Against Defamation was established in 2012 to initiate and support actions aimed at correcting false information on Poland’s history, in particular World War 2, the role of Poles in the war, Polish people’s attitude to Jews, and German concentration camps. In addition, one of the Redoubt’s objectives is to promote knowledge on Polish history and culture and contemporary life in Poland. The Redoubt’s goals also include counteracting racism and xenophobia against the citizens of the Republic of Poland, regardless of their origin. In 2016, the Redoubt intervened in over 60 cases, as many as 16 of which lead to court action. In September 2016, the Redoubt launch a semi-automatic system for identifying defamation, which spots offensive expressions, such as Polish Concentration Camps, Polish Death Camps and Nazi Poland.